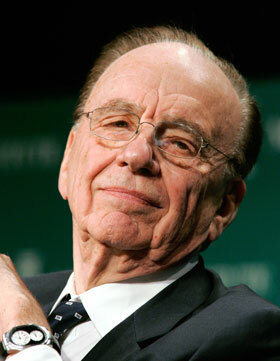 above: Rupert Murdoch- Absolute Power? Reading Melbourne’s ‘Herald-Sun’ today this author was reminded of just how far the Murdoch media (and other media interests) have been willing to descend in order to destabilise the Federal Labor government in Australia. The underlying implication is that those who wield real cultural power in this country by virtue of outrageous wealth will not tolerate Labor governments that attempt to introduce real Labor policies: that actually behave like real Labor governments. Labor is expected, ultimately, to ‘get the message’, ‘fall into line’ and then somehow we can continue with the charade of supposedly liberal democratic pluralism. Most commonly the behaviour of Australia’s right-populist monopoly media has involved the cultivation of anger, fear, resentment and intolerance via various shades of spin, and sometimes outright lies. One core aim of this policy has been to fatally undermine Labor’s core working class electoral base. The means to achieve this include monopolisation of the print media market in Australia (approx 70% of the market is controlled by NewsCorp/Murdoch); a monopoly of the dominant tabloid market in many Australian states; and the dominance of broadcast media by concentrated interests willing to abuse their control to promote their agendas. As this author has already noted on occasion: mildly redistributive elements of the proposed carbon tax have been consistently and repeatedly reviled as ‘class war’ in the Herald-Sun. Individuals on well over $100,000 a year have been portrayed as ‘working class battlers’; and the government’s policies ‘an assault on aspiration’. Apparently, however, the flattening of tax scales, deregulation of the labour market, assaults on trade unions, and the dual phenomena of privatisation and user-pays – which see wealth redistributed from ‘battlers’ to the wealthy - ‘do not count as class war’ for the Herald-Sun, Daily Telegraph – and other vehicles of Murdoch propaganda. Furthermore, the fiction of the ‘burden’ of any carbon tax is repeated like a mantra in the right-populist monopoly media; with rarely any recognition that the vast majority of revenue is pegged to be returned in one form or another to trade-exposed industry, to taxpayers, to consumers. The writers who beat up fear in this regard know very well the fiction they propagate: but apparently they are without conscience. And today, on September 4th 2011, there were another two prime examples of propaganda ‘Murdoch-style’ on pages 1, 8 and 9. One headline proclaimed “Flying into Rage grounds refugees”. Much of the monopoly media in Australia – in tandem with the Conservative parties – and especially Tony Abbott himself - has striven to dehumanise and vilify refugees. Again the intent has been to create a ‘wedge’ against Labor. The monetary costs of detention, and on one occasion the cost of flying refugees to the funerals of their family members (after the Christmas Island shipwreck tragedy) have been portrayed as a ‘burden upon the taxpayer’. (not for a moment is recognition of their basic humanity allowed, with the sympathy this might engender) And in today’s Melbourne Herald-Sun refugees who have been incarcerated in intolerable conditions – often for several years – were once more portrayed as ‘violent’. And yet there has been precious little mention of the violence of incarceration which has driven so many detainees to the point of self-harm – and on many occasions now even to suicide. Rarely ever is the question put seriously: In a country of well over 20 million what ‘cultural threat’ are a few thousand refugees supposed to pose? Whatever flaws there have been in Labor’s asylum-seeker policies (and there have been many): so much of the monopoly media have chosen to portray the High Court’s recent decision on offshore processing as ‘yet another’ confirmation of the government’s ‘incompetence’; its ‘loss of authority’; its ‘instability’ – and as further cause for an early election. These themes have been systematically emphasised - again and again - by the likes of Andrew Bolt and Miranda Devine as a part of a deliberate tactic of destabilisation. No doubt this has comprised part of a broader strategy by this country’s dominant media ‘billionaire puppet-masters’: Murdoch, Reinhart, Packer and others. Such that Australia’s media is increasingly characterised by the kind of blatant abuse many thought only occurred in Italy at the hands of Silvio Berlusconi. Underscoring this assumption: there has been precious little focus upon the accompanying consequence of the High Court’s recent decision that the legality of the Conservatives’ migration policies – and their long history of offshore incarceration and processing – is ALSO seriously in doubt. Another Herald-Sun Article today (4/9/11, pp 8-9) epitomised the ‘quality’ of tabloid journalism in this country. The article was presented under two titles: ‘Rudd’s Ambush’ and ‘One Moon, Two Fallen stars’. To begin, the authors emphasised the “dysfunctional state of the federal Labor Party”, reiterating the ‘official’ line intended to wear down confidence in Labor, and erode Labor’s core base -via ‘cultural attrition’ over the long term; and promote instability. This attempt at ‘spin’ was further emphasised with another suggestion that Kevin Rudd may be intending ‘another tilt’ at the Labor leadership; and with the contention that separate meetings between Rudd and Gillard with UN Secretary General Ban-Ki Moon were ‘unusual’. In reality such separate meetings might be considered ‘routine’; but nonetheless the ‘angle’ was played for all it was worth. That said: again the Herald-Sun attempted to ‘cover its bases’. With some of the media having been willing to suggest the viability of a Rudd leadership-challenge to ‘revive’ Labor’s fortunes – but only so far as to create instability in the current context - again now the authors attempted also to prepare the ground to meet any such ‘new threat’. While such rumours are intended to destabilise, Rudd himself ‘would ultimately have to be dealt with’ were they ever to ‘come to fruition’. But as usual this is but a ploy on the part of the Herald-Sun: which includes pretty much every day articles full-to-the-brim with prejudice, misrepresentation and spin: but with a token sentence or two at the conclusion of their articles – to maintain credibility as ‘serious journalism’. The token nature of such quotes is reinforced by the failure of Herald-Sun journalists to develop them fully: such that they could be interpreted and read as substantial and convincing perspectives. So what should Labor conclude from all this? To begin Labor needs itself to recognise the increasing tendency that liberal pluralism in this country is becoming nothing but a convenient legitimising fiction. As is the accompanying fiction that billionaire media proprietors ‘do not intervene’ in the editorial policies of their ‘assets’. Just as when - for whatever reason - Channel Ten seemed to be ‘going against the trend’ - adopting a moderately and relatively leftist profile – multi-billionaires Murdoch, Reinhart and Packer intervened. Almost overnight the political profile of the network began to change. Right-populist writer Andrew Bolt was given his own program; and employed regularly in other contexts as a political and social commentator. While direct intervention has not been proven surely it seems a credible supposition. The direct cultural power of big capital was also underscored by the earlier scuttling of the original ‘Rudd era’ ‘Resource Super-Profits Tax’ (RSPT); assaulted by a massive media propaganda campaign by the mining giants to destroy the policy and ‘send a clear message to Labor.’ Somehow the threat of an investment strike has been internalised alongside the fiction of liberal and democratic pluralism – despite the fact that the one is in contradiction with the other. At the time other areas of industry would not break the ‘united front of capital’ against any impositions; but surely the crisis is now so pronounced that this must again be questioned. In the face of such abuses for Labor the challenge is to turn the fiction of liberal and democratic pluralism in Australia’s public sphere into a reality. Attempts to promote media-diversification would no-doubt be (ironically) depicted as ‘assaults on free speech’. But the tendency towards monopolisation in Australian media – and the abuse of that power - is itself an assault upon the inclusiveness of our public sphere. And such inclusiveness is itself a precondition for genuine democracy. Labor has nothing to lose at this point by going ahead with a full media enquiry. But in the process the government must be careful not to reproduce the same kind of abuses as those they would be seeking to challenge. Rules regarding “fit and proper” people to own media could set a dangerous precedent. Today the power of wealth contracts and shackles the public sphere: backed by state recognition and enforcement of the ‘rights’ that accompany wealth. But EXCESSIVE or inappropriate state regulation of media could also set a dangerous precedent which could ‘come back to haunt’ the Left; providing a pretext for ideological censorship. Cross-ownership laws need to be tightened and effective monopolies broken up. Certainly that would be a start. We need at least two major players in every significant market: effectively representing a wide and inclusive spectrum of viewpoints. This includes more specialised markets: for instance whether we speak of tabloids or broadsheets. But we need a more pro-active policy as well. To that end: a ‘media-democratisation fund’ could be a visionary solution to the question of representative and inclusive media in this country. A fund – perhaps $5 billion to begin at a very rough estimate– could be established and then distributed equally in the form of non-tradeable shares – to all eligible Australian voters regardless of personal wealth. (ie: as a right of citizenship) Shareholders would then be encouraged – and a framework established – for them to organise their investments collectively, equally and democratically in new media intended to create genuine diversity and inclusion of perspectives and viewpoints. All profits would be returned to the scheme to be reinvested: the motive being diversification and inclusiveness – not private financial gain. This would not be an effective expansion of the state sector, however: as all citizens would have individual rights to determine their investments as equal and private shareholders. Maintaining and bolstering existing public media such as ABC and SBS undertakings: and ensuring a genuinely pluralist, participatory and inclusive outlook in these – would also serve these crucial ends. If we’re serious about liberal pluralism: about democracy and inclusion – the time has come for change. I do not agree with this view that the right wing press in Australia is manipulating working class Australians against the interests of a Labor government. The problem with this thesis is that it treats ordinary voters with contempt, and assumes people can be easily manipulated. I disagree and think people are much smarter than this. The truth is that the same media was around in the 1980's and 1990's when the ALP maintained government for 13 years. If the Gillard government is doing badly in the polls they need to look at their own performance, rather than shift blame to the media. Why would anyone in their right mind expect that the carbon tax would be a popular policy? I do however agree that media concentration is a bad thing. However I wouldn't worry. The internet is changing this. "I do not agree with this view that the right wing press in Australia is manipulating working class Australians against the interests of a Labor government. The problem with this thesis is that it treats ordinary voters with contempt, and assumes people can be easily manipulated. I disagree and think people are much smarter than this. The truth is that the same media was around in the 1980's and 1990's when the ALP maintained government for 13 years. If the Gillard government is doing badly in the polls they need to look at their own performance, rather than shift blame to the media. Why would anyone in their right mind expect that the carbon tax would be a popular policy? I do however agree that media concentration is a bad thing. However I wouldn't worry. The internet is changing this." Interesting. Yes; but before Keating there was much less concentration of print media in Australia; Murdoch now has 70% of print media in this country; And I dare say he uses his influence to determine the editorial lines of his assets. Television is also dominated by a small clique of billionaires. Yes the goverment has had its flaws and deserves scrutiny; But with so much of the media today the attacks are relentless and rather than being disciplined are mere propaganda. Governments and Oppositions should certainly be held up to scrutiny; But the context should be one of *meaningful pluralism* - where criticism and scrutiny is directed equally to all sides; and where all sides have the opportunity to present their positions authentically. That said, the answer is not so much censorship as it is diversification, meaningful pluralism, and inclusiveness when it comes to the public sphere. What does freedom of speech mean, though, if one set of interests controls 70% of print media and excludes views they disagree with? What does freedom of speech mean is so many people never have the opportuntiy to be heard because the 'cultural gatekeepers' shut them out? We need greatly increased funds for inclusive public media to counter the trends I am talking about. We need ownership laws that attempt to wind back the ownership by particular interests of any particular section of the media. (Murdoch had 40% in Britain and look at the problems there) Some are saying 50% but I don't think this would go anywhere near far enough. BTW - there are arguments in favour of the carbon tax - which I've made here in this blog as well; One reason the policy is so unpopular is because there's so much misinformation out there - reaching saturation levels. About 90% of the carbon tax is being returned to consumers, industry, tax-payers. Many will be better off. Gillard had to compromise because of minority government... This view - and these basic FACTS - are not being included or represented sufficiently. "The problem with this thesis is that it treats ordinary voters with contempt, and assumes people can be easily manipulated. I disagree and think people are much smarter than this." sure there are people who aren't so smart, there are people that are very smart indeed, and those in between. i am of the opinion that everyone has less and less time to engage in the public sphere as they have to work more to pay the bills. people are less inclined to seek out the 'truth' largely due to time constraints, and when they do have time to sit down and read the paper (or whatever it may be) they have to be content to gain their 'truth' from what's left after the editing process. i forget what all of them are but Chomsky outlines some media filters as advertiser interests (not funding publications that print too many or too-in-depth articles that are 'bad for business'); the publication's editor (who obviously needs a job); the publication owner (paid by advertisers); and the journalist themselves (self censoring to get more stories printed). ultimately all of these contribute to massive quantitative and qualitative differences in news. "All it takes is for them to deceive 5 per cent of people out there such as to turn their vote"
to assume the mass media isn't there to manipulate the public is foolish. for if they were not, we would not have to go searching for the 'truth'. or do the big boys just hire rubbish journos?